Yesterday I recorded a podcast with Wellness Mama, and we talked a lot about SIBO and different things I have done over the years to get rid of it. 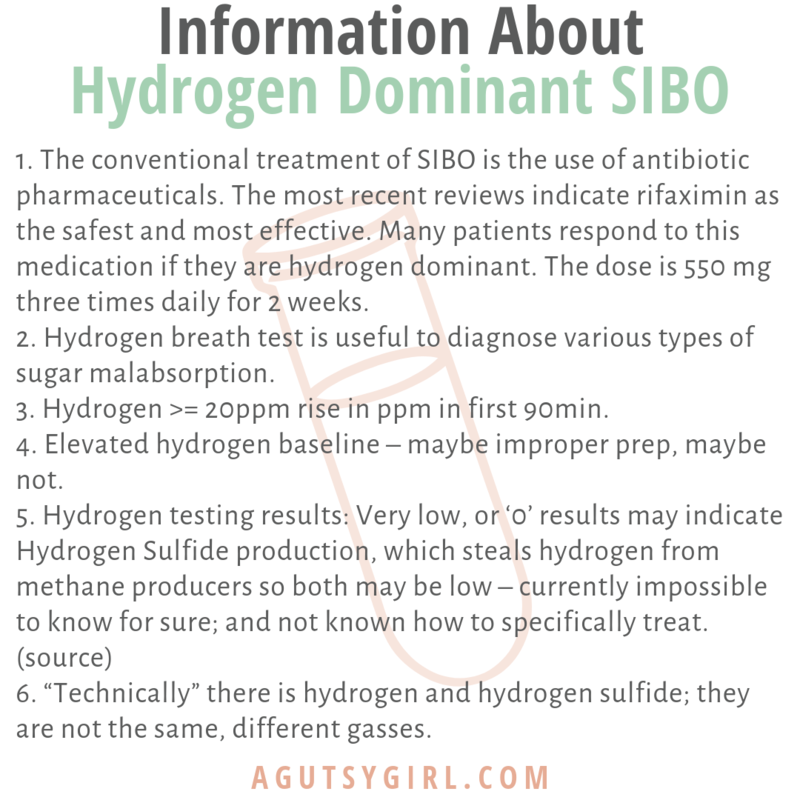 During the conversation I referenced that I was originally diagnosed with hydrogen dominant SIBO, but later on would tack on methane dominant to the drama. And yes, SIBO is all sorts of drama. The reason I shared about methane dominant SIBO first is because that’s what my most recent SIBO form was, and I was desperate to get rid of it for good – so I documented all the things. If this is your first time here, I have not had a relapse since! Boom. Anyways, today I want to focus on hydrogen because some of you are dealing with that dominance – and it’s ferocious all the same. The simplest way I have found to describe what is going on is by this easy-to-understand arrow chart extracted from Dr. Amy Myers. Depending on which gas is most predominantly produced, you can develop different symptoms and respond better to different treatments. Hydrogen-dominant SIBO typically leads to diarrhea, whereas methane-dominant SIBO is usually associated with constipation. So now you can understand why, if you have SIBO, you’re either constipated, have diarrhea or both (both versions – “hi” – me for a very long time). The best way to describe hydrogen dominant SIBO is to think of it as the first “step” for where things can go wrong. When we’re healthy, food is broken down and absorbed through the small intestinal wall. As I’ve mentioned time-and-time again, SIBO is when there is too much bacteria there and/or the wrong bacteria. When that happens, food will ferment before it can be broken down. That process creates hydrogen gas as a byproduct, and thus leading to high levels of hydrogen and a positive SIBO breath test indicating hydrogen dominance. This list is short because, on the whole, SIBO symptoms are fairly similar no matter if you have hydrogen or methane dominant SIBO. Number 1 and 2 are unique to hydrogen dominant SIBO. However, hydrogen/methane dominance does not always predict symptoms. Again, this is why we test vs. guess. Elevated hydrogen baseline – maybe improper prep, maybe not. “Technically” there is hydrogen and hydrogen sulfide; they are not the same, different gasses. To complicate things even more, there is a third type of SIBO, hydrogen sulfide SIBO. But this one is very tricky. In this case, bacteria called sulfate-reducers feed on hydrogen produced by other bacteria and produce hydrogen sulfide. There is no current, standard test for it. Sometimes, you’ll have all the SIBO symptoms and then test negative. 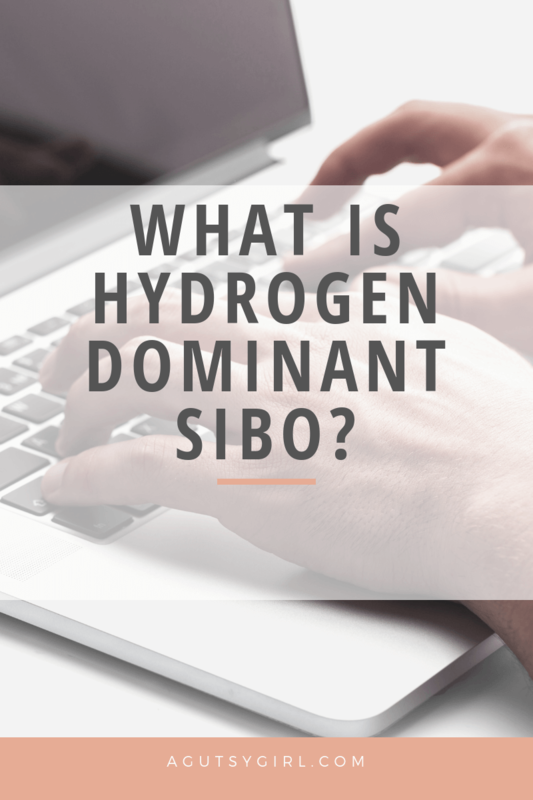 This could be why – you have hydrogen sulfide SIBO. 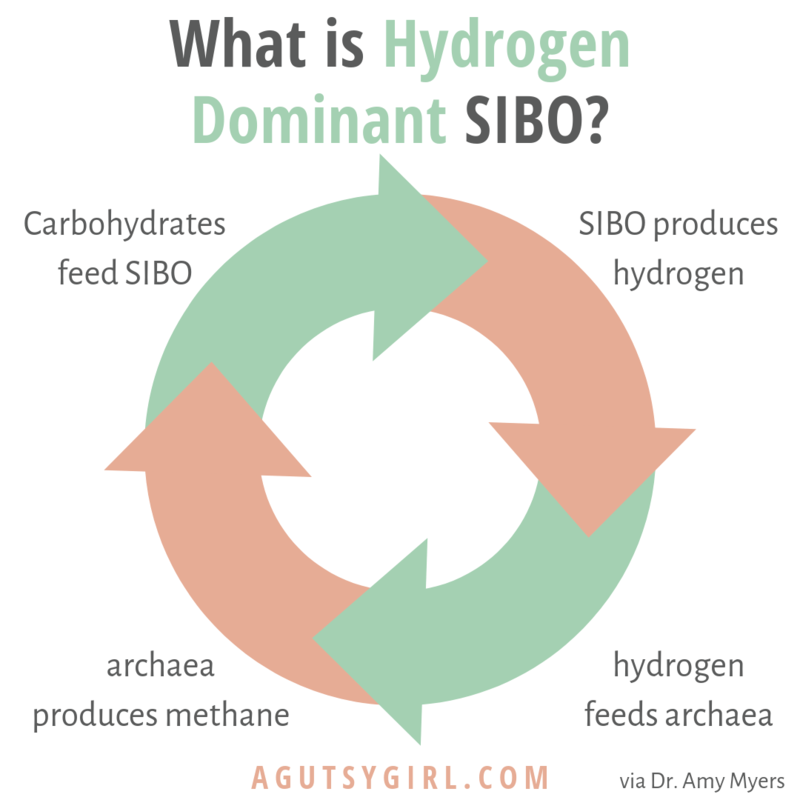 I thought about this one for a very long time, and I came to the conclusion that I do not believe there is a hydrogen dominant SIBO healing protocol. There are many different ways you could approach it, and many of these ways are the same as the methane producers. Research tells us that the biggest difference in treatment between hydrogen and methane is that if the antibiotic route is chosen, hydrogen producers do not benefit from Neomycin, as methane producers can and do. Healing both my hydrogen and methane dominant SIBO (I suspect the hydrogen sulfide as well), included probably 100 different things. Remember, I was first diagnosed with SIBO at the end of 2014. I have been feeling 100% since this past summer – the longest I’ve gone ever. I have this idea of putting together a blog post filled with everything I have ever done and tried as it relates to healing SIBO. Would that be interesting to you? In the meantime, if you want even more, listen to this podcast where Allison Siebecker talks about Hydrogen Sulphide SIBO & Preventing Relapse. Questions? Leave them in the comments below or contact me. Have SIBO and needing to follow a low FODMAP diet? I’ve got you covered. Grab, “Reasonable SIBO” HERE.